An IMSA bulletin released yesterday, July 13, reveals that from now on, the Audi R10s will have to be refuelled using the same 33 mm diameter refueling hose as the petrol-powered cars – rather than the 38 mm hose used at Sebring and Le Mans. “As was highlighted in today’s press bulletin issued by the ACO, there is an overall desire by the organizing bodies to work toward a situation where all cars, no matter what fuel they choose to use, have the same amount of energy on board,” said Tim Mayer, Chief Operating Officer of IMSA. “However, that is not the situation with the current regulations. So as an interim step, we have restricted the R10 so that it cannot receive more energy in the tank in a given time frame. 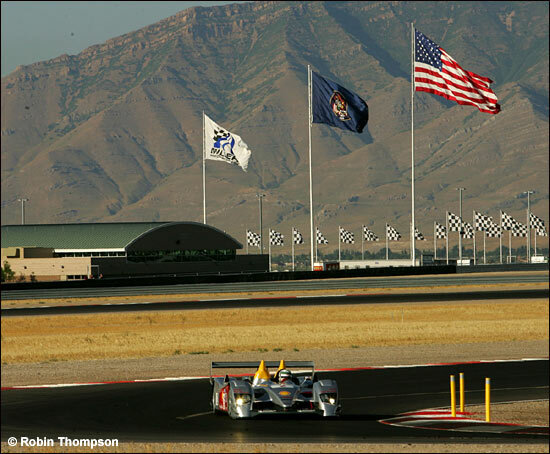 Here's Allan McNish in action at the new Utah track on Thursday evening: the Audis were third and fourth fastest, behind the two LMP2 Porsches - which have tested at the track already.